Systems thinking points to ways to build on the momentum created by last Sunday’s People’s Climate March. 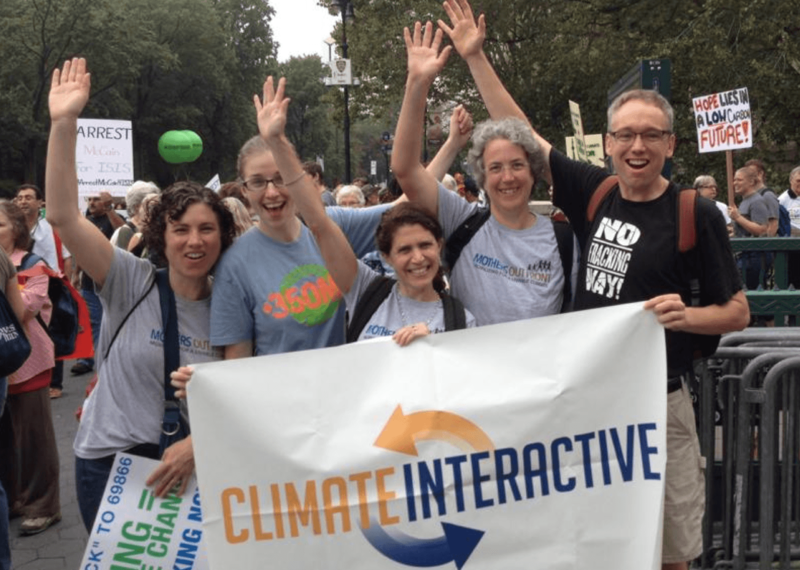 For the global climate movement as a whole and certainly for the five Climate Interactive team members who were able to march in New York City on Sunday, the People’s Climate March was an exhilarating moment. We saw each other, in our numbers, our diversity, and our commitment. We saw how many of us there are and how creative, beautiful, and passionate we are. And yet, as was true for all the great struggles before this one, each march, no matter how successful, is only a step along the way to a bigger goal. So what comes next? Take a moment to notice and celebrate. Despair and resignation feed a lack of confidence in our capacity for change and breed a self-fulfilling prophecy where, failing to see our own power, we fail to use it. In a system that is constantly changing, it’s too easy to see ourselves as we were, not as we are today. Sunday’s marches hold up a mirror that can refresh our self-perception. Maybe once we were isolated. Maybe once climate concern sat at the fringes. But no longer. Whatever next step you take, take it with the confidence that comes from being part of something big and growing. Believe in and contribute to self-reinforcing change. The last climate march I participated in was a year and a half ago. At that time, it was the largest climate march in US history. But Sunday’s march was 10 times bigger! Every systems thinker knows that only one type of process builds such expansion: self-reinforcing change, where change feeds back on itself to create even more change. In marching together – and in working together to prepare to march – new connections were built, new ideas were hatched, convictions solidified, courage grew, and people who’d never marched before stepped out. The march is over, but that expansion will last and, if we work with it, it will continue forward exponentially. Whatever next step is right for you, it will matter most if you take it in a way that feeds the exponential growth of the climate movement. Make your next step fun, make it meaningful, make it wildly inclusive. Ask yourself – how does my next action make it easier for someone else to act? Continue connecting the dots. Many have commented on the diversity of people and organizations marching in New York and around the world. We’ve known for a long time that the drivers of climate change drive other problems too, and we’ve known that climate impacts every community, every economy, every culture, and every profession, but it’s taken a while for the climate movement to figure out how to communicate this complexity and represent that breadth. The diversity of groups creating and participating in Sunday’s march is no accident but instead the result of careful work and reflection, and it shows a kind of maturation of the climate movement. The climate movement is becoming a movement that stands not only for less of one thing (tons of carbon) but also for more of lots of other things – more transparent government, more equality, better health, and more meaning in our lives. Broadening our definition of the “problem” is another classic move towards solutions in systems thinking, a move that is serving the climate movement well. So, whatever next step you are considering, you might take a step back first and look for a bigger view. What other issues connect with the ones you care most about? Who are your hidden allies? And who might need your help today as you work to protect the climate of the future? Invest in your own capacity. Systems thinking focuses on strategy over years or decades, not just on the next big event. Our work happens mostly in the time between big events, where change is slow, misunderstandings happen, and eyes glaze over in the face of complexity. It goes on as we struggle for balance, compassion, patience, and clarity. How we show up, day after day, year after year, shapes the future, including the next big event. Because of this, investing in our own mastery of both complex subject matter and our own quirks and foibles may be the most important next step we can take and the one that that determines the effectiveness of everything else that we try.